My brother sent me a large hunk of his Alberta rhubarb for my birthday 2013. It was in a very large pot, waiting for a spot to become available. Today was that day. I wrestled it out of the huge pot, accidently causing it to roll over on its top breaking off some of the leaves. Dang!! I decided to place it right in the centre of the large garden. I had to dig a very large hole. I was digging out large clods of clay below the layers of mulch. They were sticky and the usual pain. But, there were a LOT of worms. 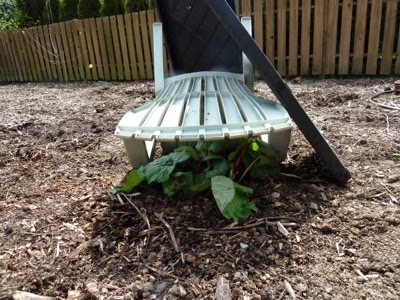 I got it planted. I then started to load the useless clay clods into the wheel barrow to put in the clay pile that we will get rid of soon. Here is the interesting part. As I was picking up the clods to put in the wheel barrow, many of them started to fall apart. Some broke in half and some really disintegrated into many pieces. Previously there was NOTHING that would break one in half let alone have it crumble. The Back to Eden technique is working!! Exactly like Paul said it would. The worms are moving the organic matter up and down through the layers of clay and breaking it down. I thought it would work, I just didn't know it would start so quickly. Thank you Paul Gautschi for your amazing techniques. It was sunny yesterday and today. 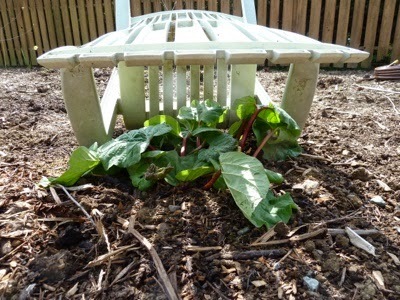 The rhubarb was a bit wilty, so I improvised and made this shade house for it. It is an overturned plastic lawn chair and large heavy duty trays. "Necessity is the mother of invention."